Keel-laying ceremonies for the third 2,000- dwt breakbulk vessel in a series of three vessels for American Atlantic Shipping, Inc.
were held recently by Equitable Shipyards, Inc., at its Madisonville, La., shipyard. The principals attending the keel-laying ceremonies as identified in the photo above were, left to right: Larry Hairston, director of engineering, Equitable; Frank Fleischer, Maritime Administration; Ms. Cheryl Lowe, project engineer, Equitable; Frank Bradley, superintendent of engineering, American Atlantic Shipping; Olin Edwards, Deputy Director, Central Region, Maritime Administration; Ron Rasmus, executive vice president, American Atlantic Shipping; Norman Hodge, general manager, Equitable, Madisonville; Rick Spillman, assistant to director of vessel planning, Moore-McCormack; Bill Gifford, Moore-McCormack resident inspector, and W.H. Livingston, vice president-marketing, Equitable. 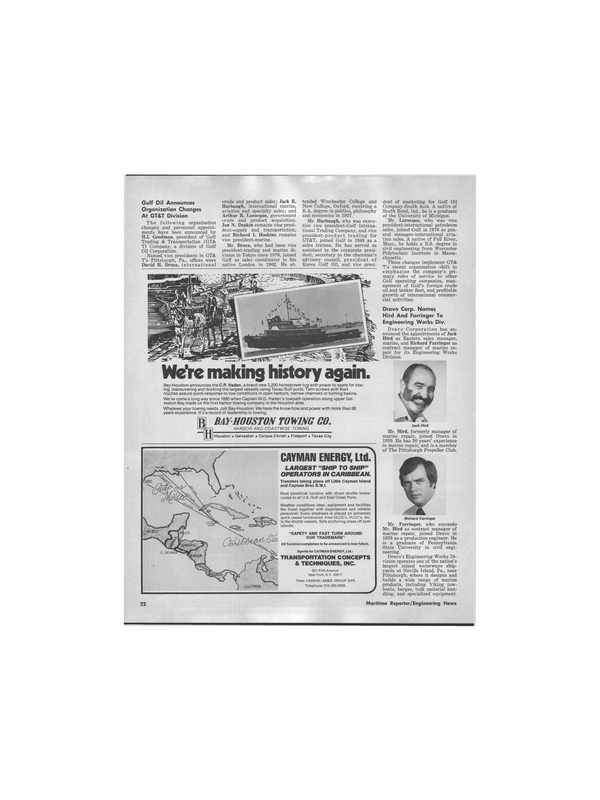 Equitable was awarded the contract on May 6, 1977, by American Atlantic Shipping, Inc., to construct three identical 2,000-dwt breakbulk vessels under Maritime Subsidy Board U.S. Department of Commerce Contract MA/MSB-399, MA Design Cl-M-122a. Equitable is a wholly owned subsidiary of Trinity Industries, Inc., a Dallas, Texasbased manufacturer of industrial, marine and structural metal products. The Equitable shipyards are the world's largest builder of lighter aboard ship (LASH) and SEABEE barges, and builds tugboats, crewboats, towboats, supply vessels, and other floating marine equipment for the offshore oil industry.